1. It comes in a decent size which has lasted me ages after everyday use, meaning I have got my money’s worth out of it. 2. The blush comes with a handy little mirror which is always perfect when you want to pop it into your handbag, all you have to do is twist the bottom of the container and there is the little mirror. 3. These blushes are very natural and you can build on the colour to intensify your desired look. Like I said I have had the blush for a very long time, I have no downsides to it, I found it a very natural finish which I could build upon to make my look either more natural or stronger for a night out. The consistency is not as powdery as you would think, it is very soft and a small amount goes a long way. 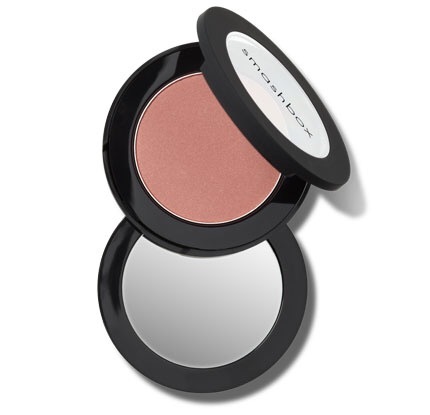 The light shimmer that is in the blush gives my face a subtle glow back to my cheeks which I love. On a 8 hour shift the blush stays put on my face it doesn’t rub off, or get onto clothing, the colour doesn’t fade and it makes my skin feel smooth and silky. I would definitely buy this blush again, in fact I think I have it in my large smashbox pallet which has 3 other shades included. They are an expensive brand but the quality is worth it. What I love about smashbox is if you go to their stand, mine was in boots, they are helpful and will go through all their makeup with you. When I went the first time they did all my makeup for free, so that I could test everything, foundation, powder, blush, mascara, eyeshadow, lipstick….. They even sell starter sets which have smaller versions of all the makeup, and each set comes ready for what ever skin tone they match you to.